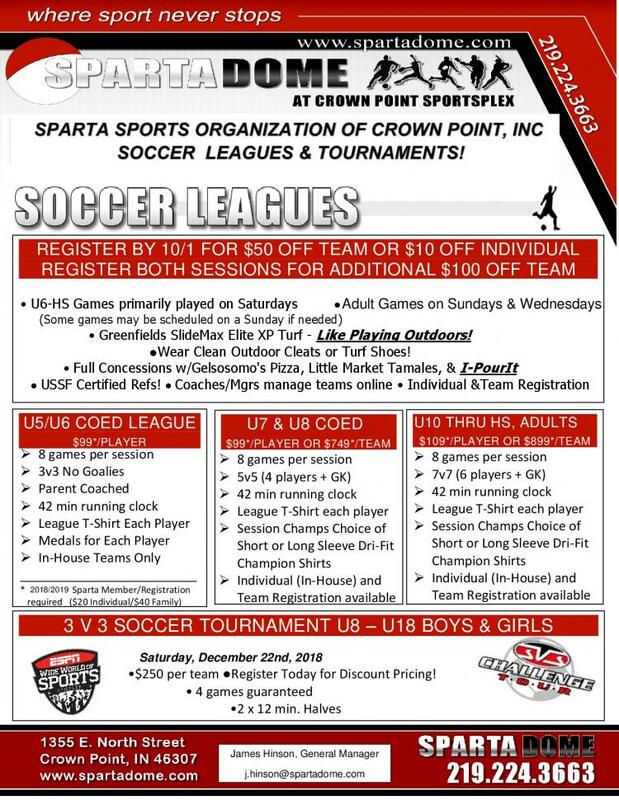 Whether you are an individual or have a soccer team during the winter you should register for the Youth and Adult Soccer Leagues at the Sparta Dome. Registration for Session 1 ends on 10/28/18 and is posted on our website. Please check out more information on our leagues at click for details If you have questions please feel free to contact the General Manager, James Hinson, at j.hinson@spartadome.com. Times for Youth are from 8am -6pm Saturdays starting November 10. Times for Adult are from Sundays 7:30-10pm and Wednesdays 9-11pm starting on November 4 and 7.